Why isn't my tempids.com temporary id badge printer not printing when I hit print? Check the light in front of the Temp ID Printer to see if it is on, blinking, or off. A solid light indicates that there is power to the printer, blinking means that there are no labels in the temp id printer or they weren't fed in properly. No light means that there is no power to the printer. If the light isn't on then it may have been inadvertently disconnected. A solid light means you might not have the USB cable connected to the printer, computer, or both. Lift the printer and look to the back to see if the cable is connected to the power socket. You may want to confirm the USB cable is connected at this time as well. If not connected plug it in, and if it was plugged in still follow the cable to the switching adaptor (the black brick looking item) and make sure the cable is connect to it and follow it to the surge protector or electrical outlet -- whatever the case may be. Connecting the power will start your prior job. Printing the student or visitor's name and picture on a sticky label seems too simple, what's the catch? There is no catch. If you're printing hard card ID badges now at your location, then you can do the same print job to our temp id badges with tempids.com's printer. Is it difficult to set up the printer? It is easy to set up the printer. You can go from taking the printer and cables out of the box, installing the printer driver from the CD, to printing temporary ids within 15 minutes. How does the time sensitive labels work with temporary badges? It is a patented formula utilizing two parts so when they interact the timing mechanism starts. I have left over labels from my other provider, can I use those labels for the self expiring temps? The patented technique only works in concert with both unique labels. I have shown several customers by using the timing sticker and using one of the labels from the other provider and found out that a week later nothing had happened. You need both unique parts of the self expiring badges to work. What is the turnaround order on the color labels for the temp ids? We get our orders out in quick fashion. Depending on your order type, size, and color selection your order ships out within three days of receiving your order. There are many times where we ship the same day! What is the turnaround on custom printed Temporary ID, Visitor Passes, Field Trips and similar labels on a roll? Depending on your order type, size, and color selection your order ships out within three days of receiving your order. There are many times where we ship the same day! I don't have a good copy of our mascot, can you supply us with one? Absolutely, we have hundreds of mascots and icons to choose from. Can I get a sample of my custom printed label roll order? Yes, we can email you a copy after receiving your artwork. We can even snail mail you samples. How do I place a custom label roll order? Please print and fill out the custom label order form and email it to info@tempids.com or fax it to 504-454-5167. 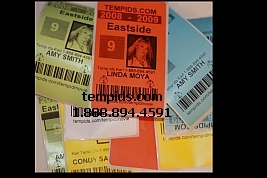 All things related to Temporary ID badges -- color labels, self expiring temps, custom labels for Visitor Passes, Students, Field trips and the like, printer, software, and tech support -- TempIDs.com. Related pages with video on the proper way to remove labels from the printer. This will contribute to your temp id printer being mechanically sound. For the super curious, we explain what the levers are for on the temp id printer. What is the light in the front of the temp id printer for? Important: Proper way to remove labels from the temp id printer.